· The software development and running are based on the Microsoft.NET Framework which has the most clients world wide and strong technology support. 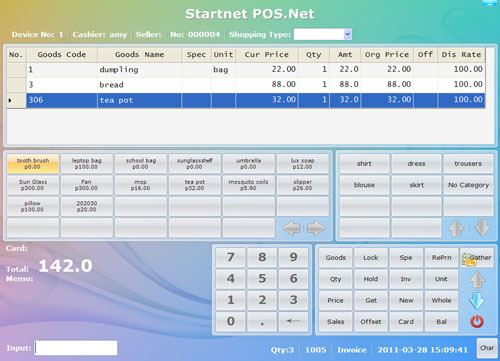 Most popular bar coded scanners, POS printers, money box, LED display screens,electric scale, IC card readers, magnetic card readers and other POS hardware devises are supported. 1) Complete keyboard and mouse operation is supported; easy to learn and use. 2) Printing format of receipt can be adjusted. Receiving printing or one by one printing are supported so as to increase business operation speed. 3) Other functions related to receiving are provided, for example, machine lock, bills holding, bills picking, bills re-generating, membership cards, single product discount, whole deal discount, discount on discount, change elimination, hand over, card and money mixed receiving and so on. 4) One product with several codes is available. Multiple packing (measurement units)is available, for example, multiple packing of cigarettes or beer. 5) Card operations are supported, for example, membership cards, debit cards, bank cards and other cards. 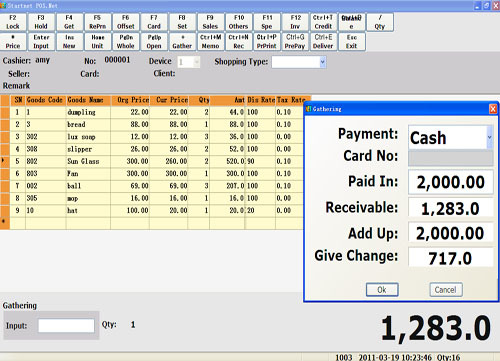 6) Receiving can be added up cashier by cashier. 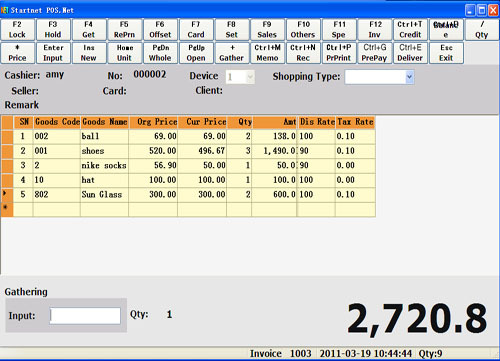 Sales can be added up and commission can be calculated operator by operator. · Business operation procedures are clearly designed. 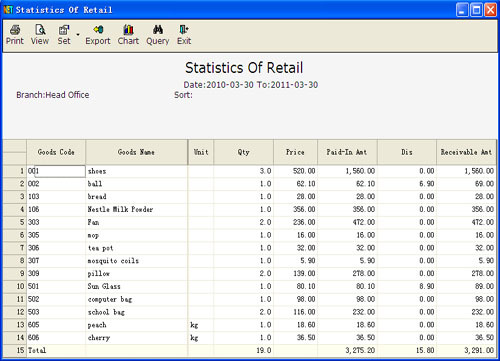 Functions of the software are powerful and user friendly. 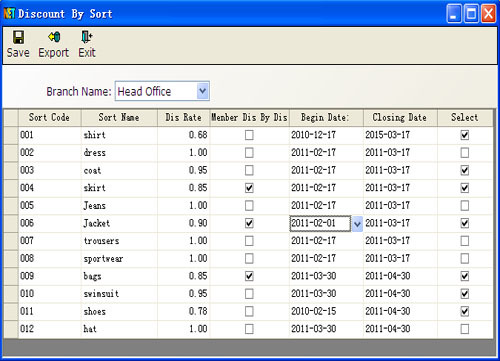 Printing format of bills and auditing reports can be adjusted by users. Reports are flexible, featuring usefulness and comprehensiveness. All charts can be imported to Excel and then adjusted to print. Suppliers management, purchase bills generation, purchase registration, purchase accounting. Clients' management, sales bills generation, sales checking out, and sales accounting. All sorts of membership cards management, debit card management, setting up of discount of products based on different categories, setting up of discounts of all the products, setting up of time periods of discount of different products, setting up for "buy one get one more" and gifts management. 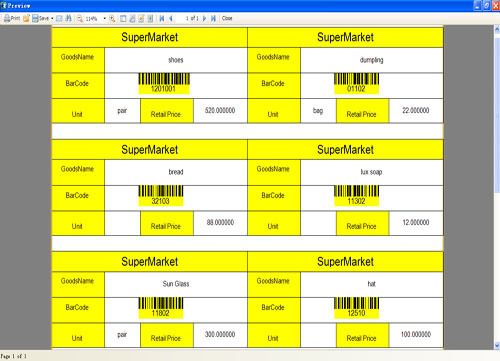 Flexible bar codes importing and direct printing functions inside, which make a wilder application of bar codes. Management and alert of maximum storage and minimum storage, non-stop accounting available so as to enable checking in or checking out when accounting is taking place, profit and lost accounting available, storage inquiry accessible. Income and expenses management, cash and bank operation management and accounting transference management functions available to make money and logistics stuff easy to read. Flexible accounting methods, which can also manage the process of the breakdown of each business bills. Excellent authority management function, including "operator-function template" authority, "operator-Qty./Amt." authority and other settings, which enables administrator to manage users' template authority and price display, so as to ensure the security of data and product price. 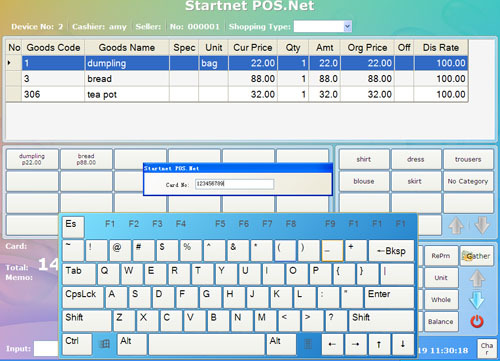 Developed by the advanced Microsoft.net technology,this series of Startnet software is beyond the E-business, Management software and Mobile Terminal field.Multi-Language version is also provided.